A. B. Curtiss is a board-certified cognitive behavioral therapist, diplomate of the board—psychology, MS, CBT,CH, MFCC, certified hypnotist, author, lecturer. Her books have been translated in 5 languages including Japanese and Russian. In the Company of Bears won a 1994 Benjamin Franklin Award, presented to the author at the American Booksellers Association Convention. The Children of the Gods received a 1998 San Diego Book Award. Brainswitch out of Depression won a Best Books Award in 2006. Curtiss is a sought-after public speaker for elementary, junior and high schools where she lectures on a number of different topics. One of the most popular is a discussion of her inspiring book about 9/11--The Little Chapel that Stood: how it came to be written, the unusual honors the book has received and how so many people have found meaning, comfort and motivation in its words. Another important lecture teaches ways to stimulate creative imagination in our high tech environment which encourages quick, often rote solutions based on ready-made thinking templates. Another important talk deals with stress and discouragement, how to make a appropriate decisions and how to find personal certainty in an uncertain world. Teachers have praised her talks on the ultimate cure for bullying that all young people should know which she covers in her book Hanner and the Bullies. She has been a featured speaker at Roundtable West, in Los Angeles; The California Retired Teacher’s Association, Much Ado About Books Festival in Jacksonville, FL; OASIS; Healing Hands School of Holistic Health, and The American Association for University Women, among others. She gave a two-day seminar for the California Council on Family Relations, and a two-day seminar about her innovative work on depression and anxiety for The National Board of Cognitive Behavioral Counselors. She has done numerous outstanding radio, TV, newspaper and magazine interviews, including San Diego Union Tribune, Chicago Sun-Times, Human Resources, Guideposts. My writing career started with a course in adult education at a local high school in Ridgewood, New Jersey. The professor said that my op-ed piece deserved to be published so I sent it to my local paper, which, living so close to New York City, was The New York Times. So the first essay I wrote was published on the op-ed page of The New York Times and was picked up by The Boston Globe for its op-ed page the next day. I even got a telephone call from the Times editorial department saying "they would be proud to publish this beautiful piece of writing." Dozens of essays followed on the op-ed pages of other newspapers such as The Chicago Sun Times and The San Diego Union-Tribune, The Christian Science Monitor and USA Today. My first children's book, IN THE COMPANY OF BEARS won a 1994 Benjamin Franklin Award, My first adult fiction, CHILDREN OF THE GODS, won a 1995 San Diego Book Award. My first adult nonfiction book, DEPRESSION IS A CHOICE was published by Hyperion. My children's book THE LITTLE CHAPEL THAT STOOD was the first children's book to be declared a historic artifact in it's year of publication (by Duquesne University) and became the subject of a doctoral thesis. It was also read to the jury in a life and death trial (the trial of the 20th hijacker (Zacharias Moussaoui.) I just assume this is a first for a children's book but I don't know for sure. Since the age of four I knew I was supposed to write, but I was almost fifty years old before I figured out what I was supposed to say. Either the words only came then, or it was only then, when I was older, that I was finally able to hear them. Words are very finicky. If you don't pay proper attention to them and write them down immediately, they go away and never come back. Writing is my calling, the ground zero of my life, what I count on, cling to. Writing is where I am the most myself even though most of my life consists of doing things other than writing. I moved many times to follow my husband's career. When our five children were grown, I went to graduate school and became a cognitive behavioral therapist. It has been good for me, I think, that I ended up being a writer second and many other things first, so that I became more a person who sometimes writes than a writer who sometimes persons. Although writing is supposed to be a lonely craft, it is because I write that I never feel alone. I am always in the company of some imagined reader to whom I tell my stories; what I have done, or failed at, or suffered, or missed. The mistakes, the fears, the disappointments, the remorse that can break your heart and have you wondering about the worth of your soul are the writer's raw materials. There is something wonderful and exciting and magical about the craft of writing. If I pursue the truth of a thing faithfully enough and doggedly enough, then, and often from a completely unexpected direction, a little of that truth reveals itself to me and I write it down just as quickly as I can before it disappears forever. In these moments when something really works, when I get it just right, I still don't know where the magic of writing comes from. But I have discovered the magic to being an author. Only at the exact moment when you are at last able to give something away do you finally possess it for the first time. On the back flap of my first book I carefully listed all my credentials, my degrees and published works, and just for fun I also listed all my children’s and grandchildren’s names. Over the years as I signed books for people I found out that most of them didn’t care all that much about my credentials. What people always showed the most interest in was all those names. 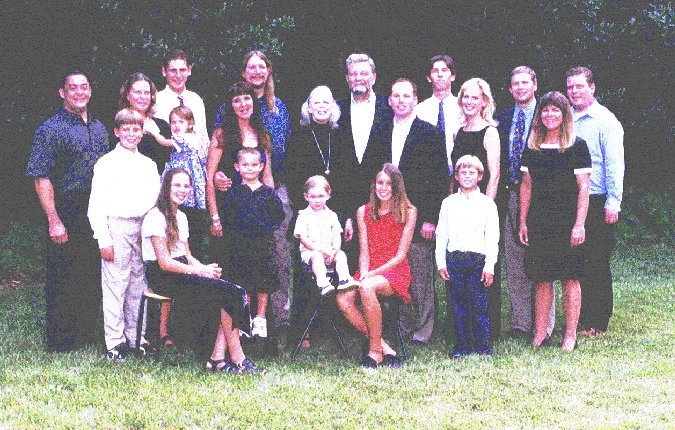 Here are two pictures of my family The first one is taken at our first family reunion in 2000. The second taken a few years ago, at the wedding of my oldest grandson. 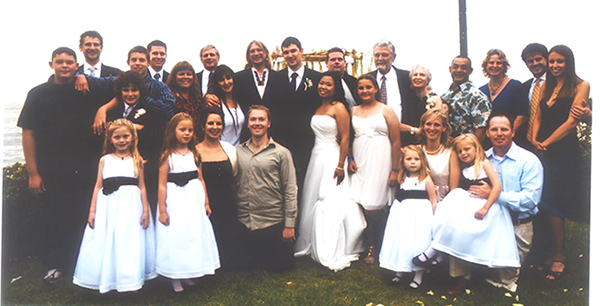 My husband Ray and I; our children: Deane, Ford, Demming, Sunday and Wolf; our daughters-in-law, Shelli and Paula; our sons-in-law, Kyle and Dave; and our grandchildren, Blueray and his new wife Teodora, Solmar, Harmony, Summer, Cutter, Tanner, Mavrik, Ayla Ray and Peregrine, the triplets Reagan, McKay and Kelsey and their baby sister Delaney. The Curtiss clan over the years.